BURLINGTON, MA. July 30, 2015 – Alpha Software Corporation, provider of the Alpha Anywhere low-code, rapid mobile application development and deployment environment, today announced it has received an Honorable Mention by Gartner, Inc. in the "Magic Quadrant for Mobile Application Development Platforms. 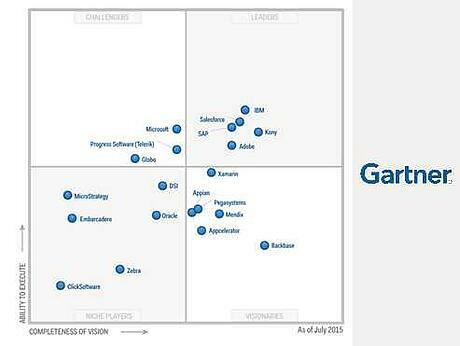 "1 According to Gartner, Honorable Mentions are "credible alternatives to the vendors included in this Magic Quadrant." "At Alpha, we constantly innovate to provide new solutions to help businesses realize the power of mobile apps," said Richard Rabins, Alpha Software Corporation CEO. "We continue to develop new solutions, including our recently-announced tablet-optimized forms capability, and are pleased with recognition in Gartner's report." According to Gartner, "The MADP market continues to mature, moving away from the tech-centric position of the past toward a more business-aligned approach, expanding support for the app development life cycle and offering more robust and scalable capabilities. Enterprises face the challenge of building and delivering a sizable portfolio of mobile apps for customers, partners and employees. Organizations that had successfully built and deployed a handful of customer-facing and employee-facing apps now find that there is a backlog of dozens, even hundreds, of apps that are needed to allow different populations of users to get data from diverse information systems, both internal and external." Built-in offline and security capabilities. To learn more, please visit: www.alphasoftware.com/.